Here’s a cute and easy Halloween dessert that you can throw together quickly if you’re needing a treat for tomorrow. I took this to a neighbor so can’t show you the inside but there is a yellow cake layer and then an orange cake layer and then Cool Whip on top so ta da! Candy Corn! Cute, right? You can get a look at the inside here on “Wine and Glue” where I got the recipe. 1 Prepare cake batter as directed on box. Divide cake batter evenly into 2 bowls and color 1 bowl of batter yellow and the other orange. 2 Spray bottom of 9 x 13″ pan with cooking spray. Spread yellow cake batter evenly over bottom of pan and place in freezer for 20 minutes. 3 Remove from freezer and carefully spread orange batter over yellow layer. 4 Preheat oven to temperature called for on cake mix box and place cake pan on top of oven while oven is preheating. 5 Bake according to package directions. As soon as cake comes out of oven, poke top all over with a wooden spoon then pour sweetened condensed milk all over top especially into the holes. 6 Refrigerate overnight or until cake absorbs milk. 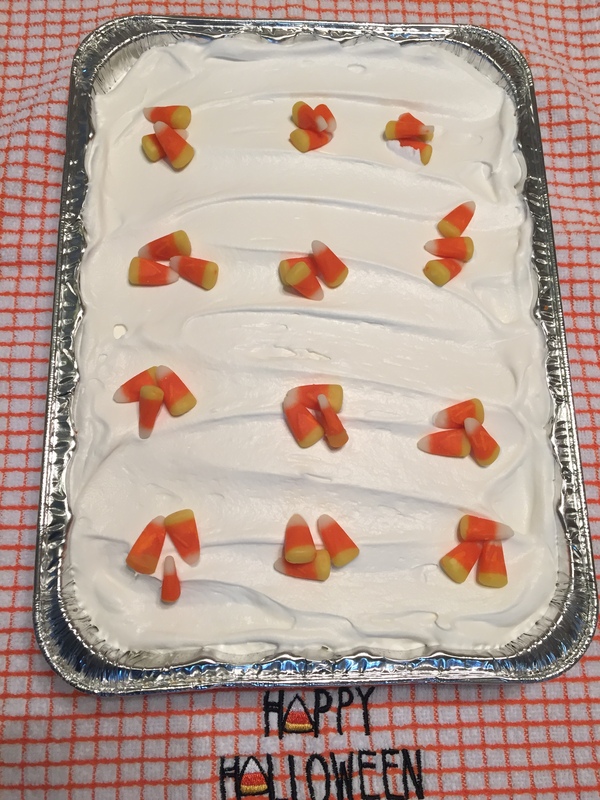 Right before serving spread Cool Whip over top and then sprinkle with candy corn.